By Karrar Haider in Mobile. Updated on December 8, 2018 . Getting a new phone is exciting, but the thought of moving all your data from the old phone to the new one may leave you stranded. Most probably, you can’t leave the data behind and a simple copy and paste won’t work either. Here’s how to move almost all of your data to your new phone the right way. That includes all your SMS, contacts, call logs, media files, configurations, passwords, apps, and app data. Let’s try the all-in-one option first before standard methods, however, this is limited to specific phones and manufacturers. Top manufacturers like Samsung, HTC, and LG, etc. offer a dedicated app to move your data from your current phone (including iPhone) to their Android phones, in usually the flagship series. These apps can migrate messages, contacts, media files, calendar entries, device settings, app data, and more. You just need to connect both the phones over Wi-Fi, or using a USB OTG cable. If your phone’s manufacturer isn’t covered above, then you can also search online. Who knows, you might get lucky. Open phone Settings and go to Backup & reset. Here toggle on Backup my data option and then select the Google account from the Backup account option. Now, the data will be synced to Google servers and associated with the provided Google account. 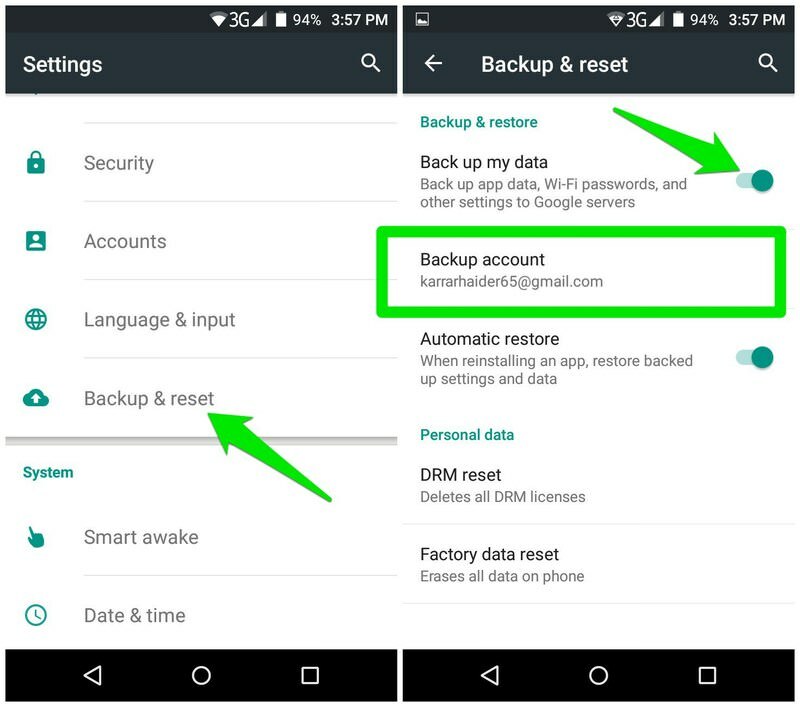 You’ll be asked to restore data when you will log in to your new phone using the associated Google account. I personally like the manual method of moving photos and videos to your PC (using USB cable) and then moving it to the new phone. However, if you prefer an online solution, then Google Photos can be a good option as well. It offers unlimited space for photos and videos if you don’t mind a little compression. Just download the Google Photos Android app and allow it to sync all your photos and videos to the cloud. 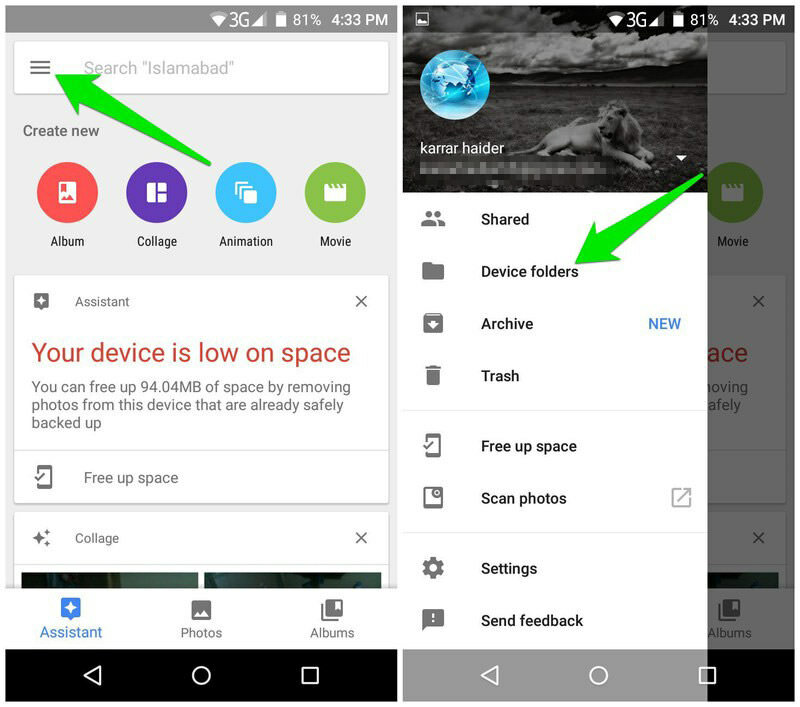 Tap on the Google Photos main menu at the top-left corner and select Device Folders. Now select the folders you want to sync. You can install the Google Photos app on your new phone to view and download the content. If you are not comfortable syncing all your photos and videos to Google servers, then there is an alternative option of using PhotoSync app. It can transfer your photos and videos over the local Wi-Fi. Using this method, the data will be transferred locally, no third-party servers involved. 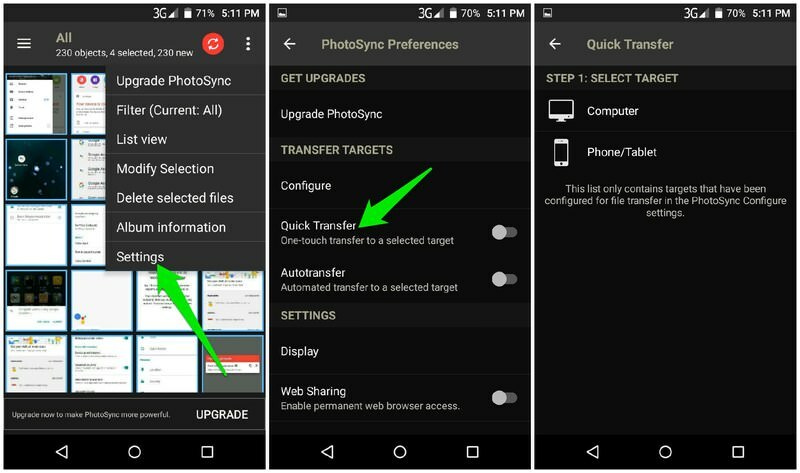 Install PhotoSync on both the phones and go to its Settings on the old phone. Here tap on Quick Transfer and select the new phone to start the transfer process. The manual method of moving to PC and then the new phone works fine for music files as well. However, you can also go for Google Play Music that lets you upload up to 50,000 personal tracks. All your songs uploaded to Google Play Music will be available on the new device as soon as you have Google Play Music installed. And you can also download the songs for offline listening. Alternatively, Send Anywhere is a good option for moving files to your new phone. It uses Wi-Fi direct to share any type of file between two phones over a local Wi-Fi connection. You can transfer music files, documents, and even photos and videos (a good alternative to PhotoSync as well). Although, there are multiple ways to move your contacts and messages to your new phone, but I am going to share just a simple app that gets the job done. Phone Copier is a tiny app that lets you share your phone’s contacts and SMS with another phone over Bluetooth. You need to download Phone Copier on both the phones and turn on Bluetooth. 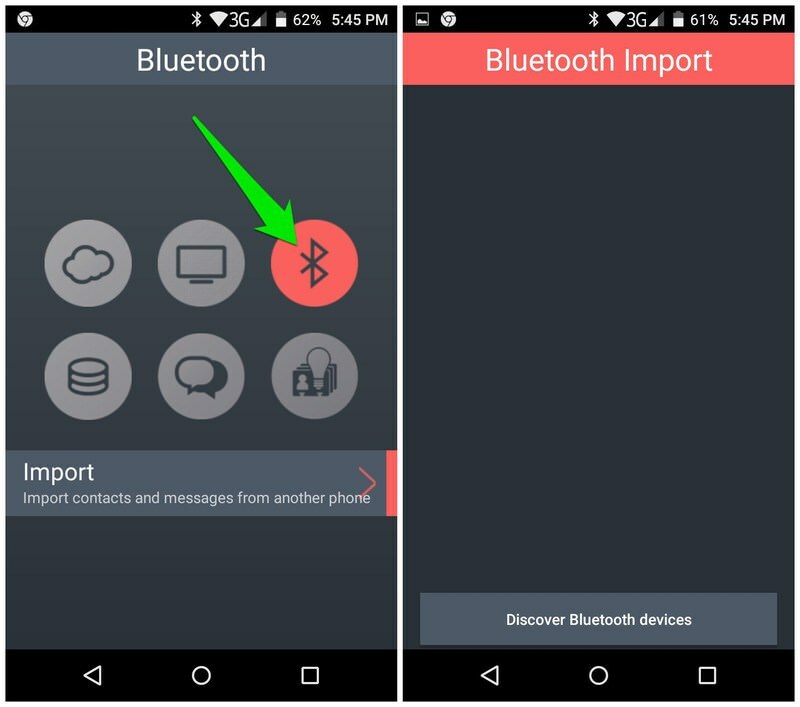 Now on your new phone, tap on the Bluetooth icon and select Import. After a disclaimer, it will search for nearby Bluetooth device and you can select the target phone to start the transfer process. Once transferred, the app will automatically place the contacts and messages in the right place. Most popular browsers have cloud storage accounts to sync all the browser data. For example, Chrome syncs all the data to your Google account, and both Firefox and Opera offer accounts to syncs data. Make sure you take advantage of such an account for your browser to sync all the data to your new phone. For transferring your complete data from old phone to your shiny new one over WiFi, using CLONEit app might be a good option. It’s a completely free app and doesn’t come with any ads to annoy you. However, depending on your phone manufacturer it may not work for you. Don’t worry though, in most cases, it should work. And when I say it can transfer all the data, I literally mean it. You can transfer contacts, call logs, SMS, MMS, all types of media files, apps, app data, system settings, Wifi networks and passwords, bookmarks and more. To use the app, you just need to install it on both the devices and tap "Receiver" on the new phone and "Sender" on the old phone (make sure both are connected to same Wi-Fi). You will be asked to choose data that you want to transfer. Once selected, all the data will be transferred at a reliable speed of up to 20MB/s. The above transfer methods should make it easy to move to your new device and take your data with you. I will recommend you to try to use an all-in-one app by your phone manufacturer or the CLONEit app to easily transfer all the data without confusions. However, if it doesn’t work for you, then you can always transfer data separately using the above methods.